This quite powerful and stunning image made me gasp and my jaw dropped with a stunned 'OMG'. It was kindly sent to me by Andrew West of Cornwall, England. Andrew tells me in regard to the caption for this image ". . . roughly translated it says they are `Gehornte Kuri-Rinder from the Buduma Area of West Africa`. If ever there was a photo or painting that made one immediately think of the kinship between the ancient auroch and both the polled and horned white Park cattle of today - this one would be it. The distinct color pattern - which is commonly referred to as the Park color pattern by geneticists today - is a color pattern found across the world in highly distinguished breeds of great antiquity and tradition. The Kuri is clearly another such breed, and I am pleased to have had it brought to my attention. 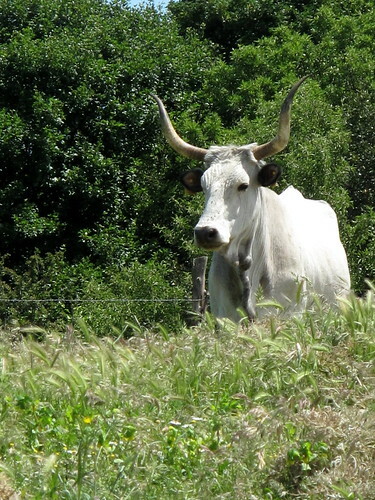 These Kuri Cattle have a quite mild demeanor (they are used for both milking and beef) about them in the image above and look to be moderate in size. The average birth weight of Kuri calves is just over 50 pounds, with the females weighing about 950 lbs. Their horns are reminiscent of the depictions of the skeletal remains of aurochs. Note the very large diameter of the base of the horns in this skeletal image. 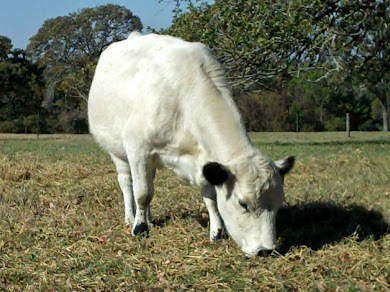 Today the predominant cattle type in Africa is Zebu based, or bos indicus. But -- it is widely held that the indigenous cattle of Africa were bos taurus. DNA studies of a wide variety of cattle breeds in Africa, including the Zuri, confirm that the Zuri is in fact of bos taurus descent. The Zuri apparently have a unique adaptation to their native hot and humid environment. They are excellent swimmers and often are led across portions of the waterways of Lake Chad by their herdsmen to reach new grazing areas, even grazing in water to eat fresh grass or sea grass, that tops the surface. Their horns, while being massive and distinctive, are actually quite light in weight and thought to be an adaptation to their native environment of many thousands of years. I've read lots and lots of old articles from the early to mid 19th century and beyond that debated the notion, or myth, that the horned white Park cattle (primarily the Chillingham herd) that roamed the British Isles were actually some how a singularly pure and direct descendant of the 'auroch' race -- aurochs being the original truly wild and very large beasts that inhabited Europe, Asia, and Africa. That old myth has been well debunked in the 21st century. Even so, the color pattern was clearly present in both the European and African auroch. 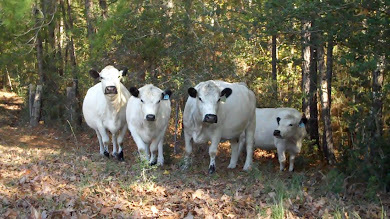 The Zuri quite beautifully exhibit the Park color pattern, and particularly the recessive red that was the subject of the greatest portion of the first recorded European oral and written histories that reference both the milk-white polled and horned examples of white cattle bearing the Park color pattern. 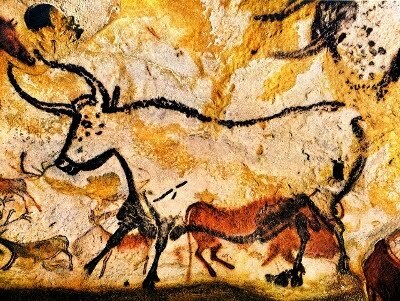 Cave Painting in Lascaux ,France - c. 15,000 B.C. I've run across representations of cave paintings over the years that included illustrations of white beasts, speckled beasts, and black ones with a white line down their back - which, as discussed in a February blog, has long been known as the Riggit pattern. What I never realized is those cave paintings are considered to be drawings of the auroch - so I deserve quite a thump on the head for missing that! 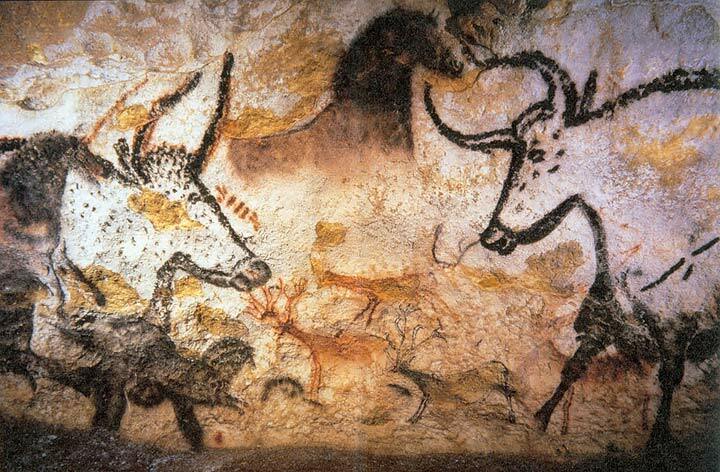 You can see in this first photo that the aurochs represented in this French cave painting are white, with darker noses, and actually speckled as well. 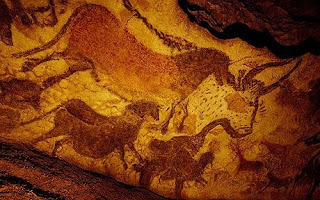 And this next one also shows a white speckled auroch, along with a horse and some other type of small animals which are portrayed as brownish in color. 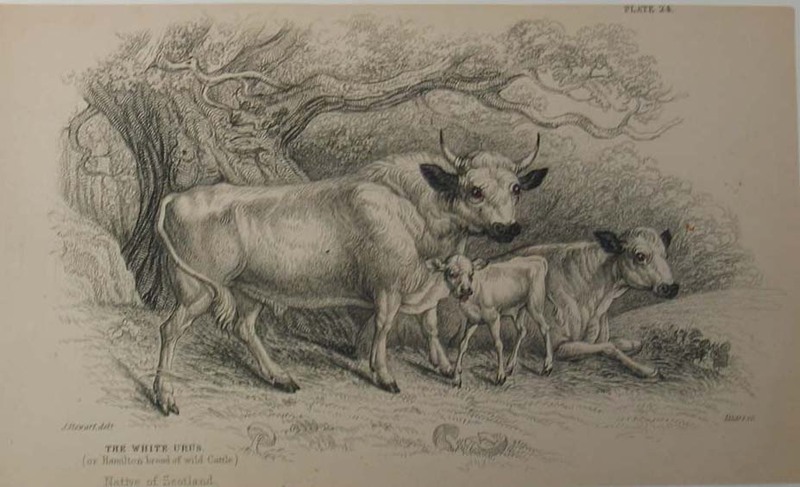 The ears and nose are distinguished as a different color in both drawings, and in the first drawing you can see that the legs are dark - quite like both the horned and polled Park cattle of today. In 2010 it was reported that an experiment had commenced to attempt to re-create an auroch from breedings amongst those modern day domestic breeds considered to be most representative of the auroch. In this article from The Telegraph we are told that the Highland of Britain and the ". . . white Maremma breed from Italy," are two of the breeds being used in this experimental "back-breeding". If you do a web search for images of the Maremma breed, you get results with both white examples and grey examples of this breed, also two different spellings: Maremma and Maremmana . Here is a photo of a "white Maremmana" . . . The inclusion of the white Maremma in this experiment certainly indicates that the scientific community considers the Park color pattern to be one of great antiquity that indeed was found in the indigenous aurochs of prehistoric times. But then, I would think that most every basic, or root, coloration of modern day domestic cattle would track back to ancestral aurochs . 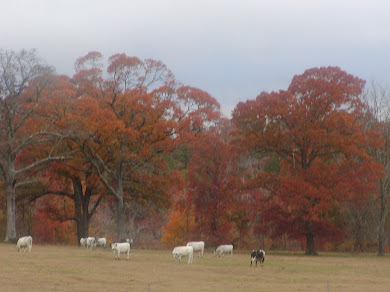 . . What I find sad, inexplicable, and irritating is that clearly the milk white auroch of prehistoric times -- as well as the milk white cow of modern recorded history -- were both highly revered back in days long long gone . 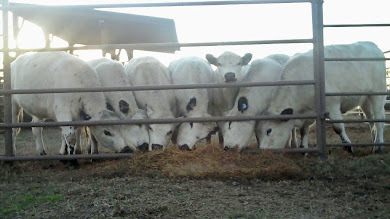 . . NOW, they are generally found undesirable here in the USA by the commercial cattle industry . . . thanks in large part to the promotional success of Certified Angus Beef and the dominating USA demand for black hided cattle. 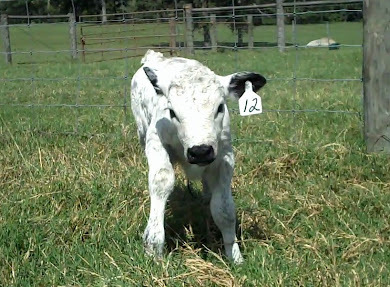 The future of British White Cattle continues to be in the hands of largely hobby farmers in the USA. 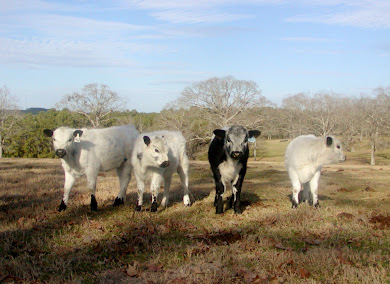 Their owners are captivated by their beauty and uniquely gentle natures, and of course the quality of the beef. 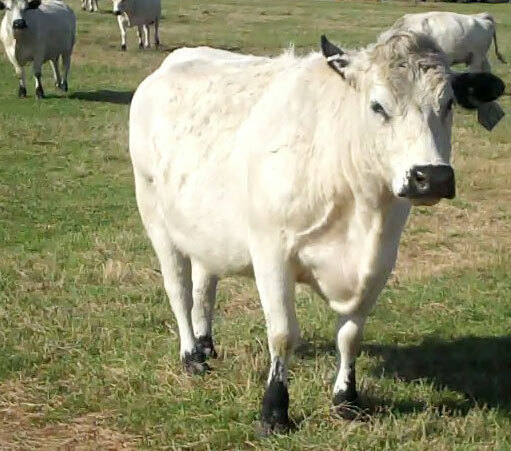 If you would like to help promote greater awareness and acceptance of polled British White Cattle in the mainstream cattle industry - visit the United Kingdom's British White Cattle Society web site for additional information.